Does your sound system buzz, hiss or make some other kind of unwanted noise? The problem is most likely rooted in bad cables. Regardless of how good your mixer, amps or speakers are, you will never get a good sound if you don’t have the right cables. You don’t need the most expensive cables to achieve the quality of sound you desire. But, you do need to see cables as something worth investing in. Below, you will find the cables I recommend. I have used these in my church for years and I am very happy with the results. Unbalanced cables have two wires: one that carries the signal and a common ground. They are also shielded to help protect from unwanted hum and other noise. Instrument cables are typically unbalanced as well as many patch cables. They are used to connect high-impedienace signals (guitar, keyboard, guitar pedals, etc) to an amp, mic preamp or direct box. Unbalanced cables should not be longer that 25 feet. Balanced cables have a third wire that also carries the signal, but in reverse. 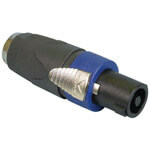 This causes any unwanted noise to be eliminated, making them ideal for longer cable runs. Balanced cables generally have either a XLR or TRS connector. While in a few cases balanced and unbalanced cables are interchangeable, it is the output source you are connecting that will determine which type is needed. For example, microphones usually require a balanced cable as do direct boxes. In short, a direct box converts an unbalanced signal (i.e. from a keyboard) to a balanced signal so it can then be sent over a long cable run back to your mixer. Considering your keyboard player is probably more than 25 feet from you mixer, a direct box is your solution to getting the signal back go the mixer without unwanted hum or noise. TS connectors come in 1/4” and 1/8”. 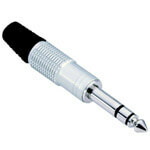 They are used for unbalanced operation with instrument, patch and speaker cables. The easiest way to tell them apart is they only have one ring (usually black) on the shaft of the connector. TRS connectors come in 1/4” and 1/8”. 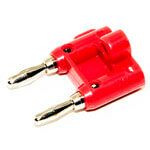 They are used for balanced or stereo operation with microphone or patch cables. They have two rings on the shaft of the connector, making it easy to differentiate from a TS connector. 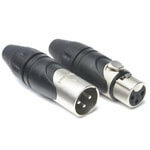 XLR connectors are used for balanced operation with microphone cables. They are most widely used with microphones, but you will also find them on balanced patch cables and DMX lighting cables. Speakon connectors are used to connect amps to speakers with speaker cable. They are becoming increasingly popular because they lock into place and therefore cannot become accidentally disconnected. Banana plugs are used to connect amps to speakers with speaker cable. You will most often find them on the end that connects to the amp, which enables you to easily set up bridge mono operation. Instrument cables connect a guitar, bass, keyboard or other electronic instrument to an amp, preamp or direct box. 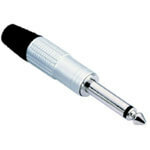 They carry low-voltage signals and generally have 1/4” connectors. They are considered unbalanced cables, which means they are susceptible to noise and should be kept as short as possible (certainly under 25 feet). 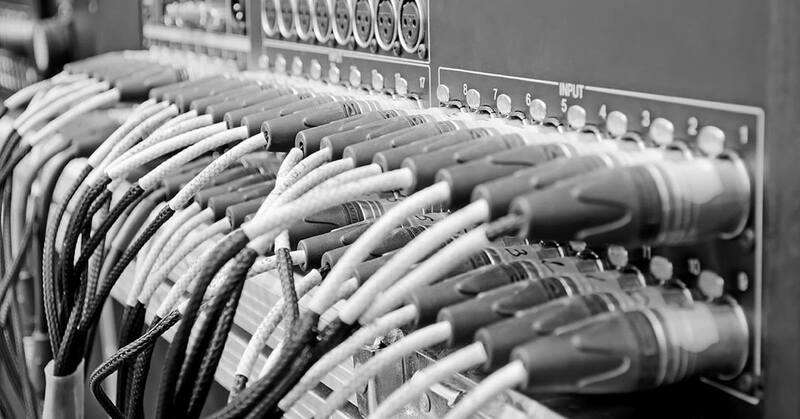 Patch cables are used to connect various audio components together. They are generally short in length and may be balanced or unbalanced, depending on their application. For example, when connecting a series of guitar pedals, you will use unbalanced patch cable considering the signal coming from the guitar is also unbalanced. Patch cables come in all shapes and sizes. You can get almost any kind of connector, including XLR, 1/4”, TRS and RCA. When choosing a patch cable, you must first determine if the audio source is balanced or unbalanced. Then, it is just a matter of getting the right length and connectors. Keep in mind, the only balanced connectors are TRS and XLR. The others indicate an unbalanced cable. Many confuse a speaker cable with an instrument cable, especially when they have a 1/4” connector on both sides. However, they are not the same. An instrument cable is not capable of handling the high voltage that is pushed from the amp to the speaker. It may seem like it is working, especially at low volumes, but your amp is having to work extremely hard to push the signal through such a small conductor. Eventually, the instrument cable will heat up, melt the jacket and cause a short circuit – potentially ruining both the speaker and the amp. When buying speaker cables, the gauge of the cable becomes an important factor to consider. Keep in mind, the lower the number the more ‘thick’ the cable is. So, a 12-gauge cable is thicker (has more wires) than a 14-gauge cable. A cable that is too ‘light’ (gauge is too high) will result in amplifier power being wasted. It will also cause a loss of low-frequency performance. On the other hand, the only downside to having a ‘heaver’ cable than you need is excessive cost. Following is a chart to help you determine what speaker gauge you need. I have found that 12-gauge is most often the appropriate choice for church sound systems. Well written, simple, & to the point. Especially helpful to the neophyte sound person advising or assembling their own system. I like your table for impedance/gage/length. The advice is good for most any app except perhaps a Woodstock size system! Then I’d go heavier for bass (e.g. 8-10) even heavier for subs keeping those runs as short as possible. One thing to remember when determining gage choice w/any given amp/speaker combo is specifically HOW load impedance affects power output. Connect each channel to a different speaker- one 8 ohm & the other 4 ohm, and power up the system. While the 8 ohm receives, say 100 watts RMS, the 4 ohm will receive 200 watts RMS. Where this get a little complicated, both channels measure the same voltage. However the 4 ohm will pull TWICE the current. A closing side note to this impedance/gage/length discussion. I upgraded 10 gage to 7 gage (double run of 10) to connect 3 ohm subs for a home theatre system. The upgrade demanded system retuning! Size does matter! Why is a speaker cable unbalanced vs balanced? Speaker cables are considered unbalanced because they only have two conductor wires. Keep in mind, there is no such thing as a ‘balanced’ speaker cable. A speaker cable is a speaker cable…and not to be confused with an instrument cable. Adam, please note that if you are using active (powered) speakers with the amps built into the speaker, you should ALWAYS use balanced cables! (or at least whenever possible). Well written. I would like to add a few notes however. First, just like speaker cables vs. instrument cables, not all XLR cables are created equal either. Specifically, I am thinking about DMX cables. While most churches in a permanently installed location may not have to worry much about this, portable churches with LED Lighting fixtures will very likely need to keep DMX and Audio XLR cables separated, especially since most low end lighting uses 3 Pin XLR. The actual cable is different, and DMX cables have an additional impedance. Will they work interchangeably? yes… usually, but It is not ideal, especially for the lighting fixtures which can start to get pretty random. Secondly, not all signals are created equal. Even though your digital console might have an XLR out for the mains, if the output says “AES/EBU” or something like that, you will NOT like what you hear if you put that signal into an amplifier as an analog input! The same thing can happen with RCA outputs. They can be either analog (which will talk to other equipment via patch cables) or “S/PDIF” which will only talk to other S/PDIF inputs on other digital equipment. While those two points may seem like no-brainers, to the audience that will get the most from your post they are at least worth mentioning in my opinion. Thanks for the tips, Trent! Very helpful stuff Kade! The only thing I would comment, is regarding speaker wires the heavier gauge is to handle additional current (amps) not voltage although the voltage for a speaker is much higher. Hey, Kade. Just a heads-up. I find that many of the issues with humming (ground loops) and, in some cases, buzzing come from improper electrical wiring. In fact, system noise is not always about your choice in audio cables. Stuff that seeps into the system can sometimes be a simple as having dimmer switches incorrectly installed in your place of worship. Great point, Gary. Thank you!